Wood look tile seems to be the top flooring trend of late, but we’ve been thinking about it ever since we bought the ‘Zoo and felt eww on our feet. The peeling vinyl tiles, complete with faux grout lines filled with 20 years of gunk, the ‘newer’ but threadbare shag carpet with cheap pad, and the exposed metal teeth on the thresholds that shred our soles, the smell emanating from the guest rooms, plus my allergies, had us shopping for flooring from day one. Last spring, we excitedly began tearing out flooring, but the need for less disgusting flooring was soon superseded by the practical desire to protect our home investments and improvements by doing a re-roof for our big project of 2014. Now, 2015 is the year of the floor. Note the stain on the far right side. This carpet is seriously gross people. This is a color body tile called Barnwood in color Pecan by Storka. We definitely wanted a color body tile where the color goes through the body of the tile so that chips and scratches are less noticeable if they happen. The second tile beside it was our second favorite, another Storka product called Saison in color Angers. It was also nice but was more uniformly dark. The third tile, the gray, was something some neighbors of ours got from Home Depot and had installed in their home over the winter. It looks great in their house, but we just didn’t want to go so gray and so weathered for our floors. We thought Barnwood combined the more traditional deep brown with just enough weathered gray visually and, on a practical note, would provide better camouflage for dirt/sand/pet-ness and be less slippery for wet feet. #1 is Storka’s Barnwood in Pecan (our original favorite). #2 is Storka’s Saison in Angers (our original second favorite). 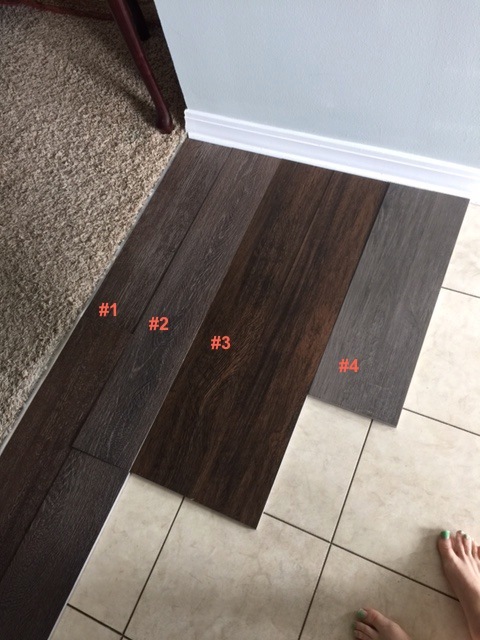 #3 is Marazzi’s American Heritage in Spice (a new interest). #4 is a new Storka product called Lodge in color Forest. 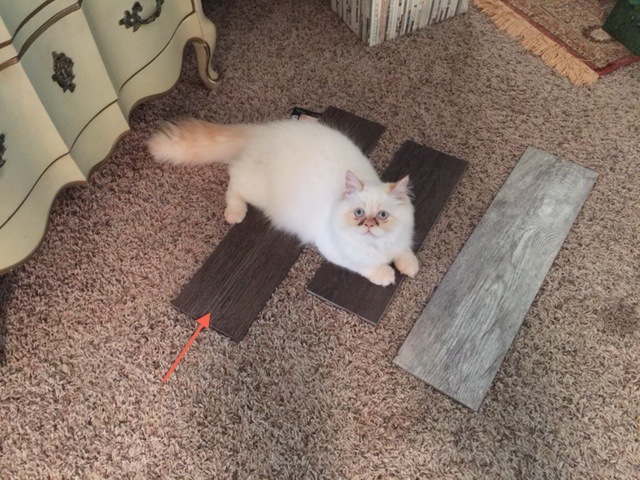 All of these products are color-body porcelain tile, though we observed that the Marazzi tile appeared to have a grayer body than its reddish-brown top. Courtney pointed this out to us but also reminded us of the hardness of porcelain with respect to potential for chips and scratches. 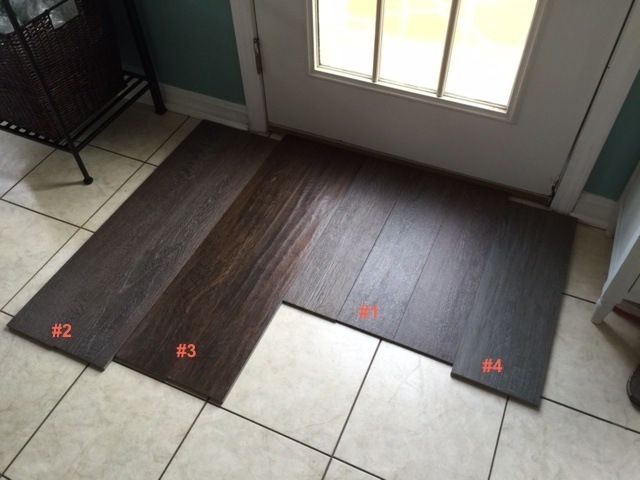 We like that #2, 3, and 4 all come in longer lengths, making them more like wood floors. We placed them in different areas of our home with more and less natural and artificial lighting to see how they looked and watched them throughout the day as the position of the sun changed. We also walked on them to get a feel for the texture. When we laid out all the samples, #3, American Heritage Spice, became our new frontrunner. 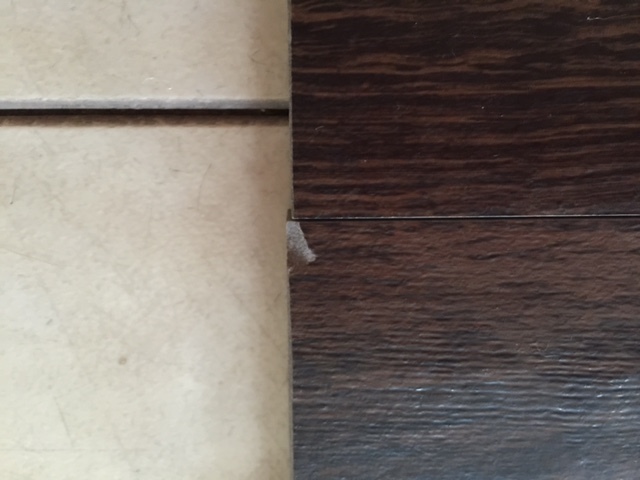 It had all the rich, warm tones and hand scraped look we love about wood but didn’t necessarily expect to be able to achieve with wood look tile. It was the most realistic looking of all the tiles that made the Final Four and also felt the most like wood to our feet. Compared to #3, the others looked decidedly more muted. Though less apparent in the picture, #2 had a rougher, oddly synthetic-feeling texture to the feet, and once we felt the difference in texture, we could also see that difference. #4 was the least wood-like of all of them and the most gray but still had an appealing feel and pattern. We also noticed a lot of color variation in our original favorite, #1, as you can see in the picture above. In person, the piece on the right side looks very red, the left looks very brown, and the middle piece looks very gray. We like some variation and understand that real barnwood would also have considerable variation but are somewhat undecided about whether the variation will draw attention to the shorter ‘board’ length, making it more apparent that these are tiles and not wood planks. We also experimented with durability and ease of cleanup. I might have squirted mustard on the samples. And etched them with a screwdriver. And dropped things on them on purpose. All of the samples fared relatively well at the cleanup and destructibility tests, though #3 suffered a couple of chips (not from our tests but possibly from transit?) that revealed that the Marazzi definition of color body was indeed suspect. The top has a reddish brown, but the color underneath is decidedly gray, which was very obvious when chipped. Not exactly our definition of color body. This was sad news for #3, as we were leaning towards this until the chipping gave us cause for pause. Right now, we are undecided. What do you think? We’ve tried to tell Hermes we have to choose just one. He doesn’t seem to agree. Update on the Tile Trial: We’ve been keeping an eye on our tile samples throughout the week. Spice, which was starting to become our favorite, has started to show signs of damage that furniture markers/Sharpies cannot hide…and the brown/black markers actually don’t match, so it now looks like we’ve drawn on the floor. Womp, womp. Stay tuned for the final decision!